August 11, 2018. 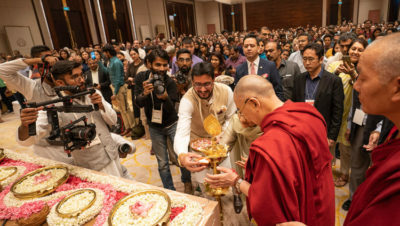 Bengaluru, India – This morning His Holiness the Dalai Lama was invited by Vidyaloke, a group whose name alludes to the light of wisdom, dedicated to rekindling appreciation of ancient Indian spiritual traditions of which Buddhism is part, to talk to Young Professionals and Students. When he entered the hall he was accorded a traditional Indian welcome with flowers, incense, music and so forth. He then took part in lighting a lamp to inaugurate the occasion. Veer Singh offered a few words of greeting and thanks to Vidyaloke’s supporters. A hush fell upon the crowd and His Holiness began to speak: “Brothers and sisters, firstly I want to make clear that I use these words because of the sense I have of the oneness of all 7 billion human beings alive today. If we are to create a more peaceful world, made up of peaceful individuals, we need a greater concern for others—altruism. That gives inner strength, self-confidence. When you don’t have much concern for others and you feel you’re the centre of the universe, you’ll be dogged by feelings of suspicion left and right. No matter how educated or wealthy you are, if you don’t have peace of mind, you won’t be happy. “I’m a practitioner of the Buddhadharma, a follower of the Nalanda Tradition, and our main practice is to focus on the welfare of all sentient beings—bodhichitta. We pray for the benefit of all sentient beings, but there’s not much we can do for beings in other galaxies. Even on this planet there are limitless insects, birds and animals, but there’s little we can do to teach them. In practical terms the beings we can help are human beings because we have language and we can communicate and share our experiences. “Besides natural disasters, many of which are now associated with climate change, we face plenty of problems that are essentially of our own making. As social animals, we depend on the community for our survival. All our religious traditions have the potential to yield peace of mind and emphasize love, kindness and self-discipline. This is why the idea that in the name of religion, sometimes the same religion, people are not only in conflict, but are killing each other, is unthinkable. His Holiness explained that he is also committed to encouraging religious harmony and that he takes great inspiration from the way all the world’s major religious traditions live together side by side in India. As a Tibetan he has a responsibility to the Tibetan people, the majority of whom place their trust in him. However, since 2011 he has devolved his political responsibility to an elected leadership. He mentioned how as a child it became clear to him that Tibet’s institutions were in need of reform; that there was too much power in the hands of too few. In 1952 or 53, he set up a reform committee which only met with limited success because the Chinese wanted any reforms to be done their way. Once in exile, in 1960, Tibetans were able to take the first steps towards democratization. His Holiness explained that Shantarakshita, the Nalanda master who established Buddhism in Tibet, and his chief disciple Kamalashila were both skilled philosophers and logicians. Consequently, the use of reason and logic were integral to Tibetan Buddhism from the start. What’s more, with Shantarakshita’s encouragement, Tibetans began translating Buddhist literature from Sanskrit into Tibetan. In the course of this the Tibetan language was renewed, enriched and refined so that today Tibetan remains the language in which Buddhist thought can be most accurately expressed. His Holiness added that his concern for Tibet also extends to its natural environment, keeping in mind that a majority of Asia’s great rivers rise on the Tibetan plateau. Unless trends change, the steadily reducing snowfall on the mountains will lead to a severe shortage of water. “My fourth and most recent commitment,” His Holiness revealed, “is to the revival of interest in ancient Indian knowledge, specifically its understanding of the workings of the mind and emotions. Modern Indians don’t pay much attention to these things and yet everyone can relate to tackling their destructive emotions. Observing physical hygiene we remain physically fit; by developing a corresponding emotional hygiene, tackling our mental afflictions and destructive emotions, we can become mentally fit. Answering a series of questions from the audience, His Holiness recommended that to be effective a teacher should be concerned about her students’ lifelong well-being. She needs to present a practical example of warm-heartedness in her own conduct. He advised another teacher who asked for a mantra to give her pupils to teach them to say Om ara patsa na dhi, which belongs to Manjushri, the bodhisattva embodying wisdom. He illustrated Indo-Tibetan relations by quoting a 15th century Tibetan master who said that until the light of India reached Tibet, despite its being the Land of Snows, it had remained dark. The same questioner had asked if Buddhism was based on a hatred of Hinduism. His Holiness told him that the two traditions have the three trainings, ethics, concentration and penetrative insight (shila, shamatha and vipashyana) in common. Citing a conversation he’d had with a Swami here in Bangalore, he explained that where the two traditions differ is in their stance on atman or anatman. However, His Holiness told the Swami, you believe in atman, I believe in anatman—it’s a matter for personal judgement. There were several questions about how to deal with anger. His Holiness pointed out that when you are angry it’s more difficult to see a solution to problems. It’s also more difficult to judge right from wrong. He recommended reading Shantideva’s ‘Guide to the Bodhisattva’s Way of Life’ that is now available in a wide range of languages. In chapters 6 and 8 the book explains the best ways to deal with anger and narrow-minded self-centredness. His Holiness told a young boy anxious about ecology, that as a member of the 21st century generation he represented the future of the world. He added that if steps were taken now to protect ecology, in 30 or 40 years time the world might be a better place. His Holiness added that demilitarization, including the elimination of nuclear weapons, was a worthy goal, but to achieve it would require extensive inner disarmament. In a town where many people work for information technology companies, His Holiness declared that such technology has its source in the human mind. It’s crucial to remember that for technology to be useful, human beings should control it. The final question of the morning was about the purpose of life. 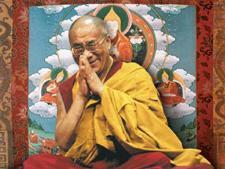 His Holiness was unequivocal that the purpose of life is to find happiness and joy. Nothing is guaranteed, but we live in hope. When hope is lost we have nothing left and may become suicidal. So, the obvious conclusion is that the purpose of life is happiness and joy. At this point he said it felt like time for lunch and the audience applauded. Tomorrow His Holiness will give a more general public talk at Vidyaloke’s request.